This page is an evolving, non-exhaustive collection of different methods and techniques that can be used in scenario building, particularly focusing on the ones that might be useful for Future Fabulators. There are many academic papers and consultants' websites describing a myriad of approaches to “how to build scenarios”. Though possibly oversimplifying the issue, we could say that for Future Fabulators the most important difference between methods is whether the scenarios are designed to be exploratory (multiple alternative scenarios for different possible futures), or normative (designing a desired scenario, then figuring out what needs to be done in order to get there). When working with normative scenarios the most interesting work is that of 'backcasting' or 'retrocasting' as we prefer to call it (see chapter below). With exploratory scenarios much time is spent on identifying constants and variables of a situation, that make up the scenarios (as characters, events, plot-lines…). These scenario components are derived from the key factors in the wider context of an issue (e.g. from the internal and external envrionment, past and present conditions), as well as the 'drivers of change' (micro and macro forces that influence change in a community, organisation or system). There are many possible answers to the question “how to build scenarios”. We won't attempt to collect them all on this page. As a filter in our research we decided to look at approaches that can help us move from forecasting to embodiment, from story to experience. In Future Fabulators we are primarily focused on creating (immersive) situations where possible futures / parallel histories or presents can be physically experienced (and then reflecting on how this experience can affect our present behaviours). Therefore for FFab it isn't extremely important to have the most accurate representation of past, present and possible futures. We are more curious to uncover conscious and unconscious assumptions that the participants might have about their lives and environments and seeing how these assumptions shape and distort their images of the future. The scenario process uses these assumptions as raw materials in creating storyworlds. During the scenario process our awareness of assumptions grows through non-judgmental observation and several waves of analysis and synthesis. On this page we review existing scenario building methods to make available a wide palette of methods to apply and customise for different groups with whom we co-create scenarios. The most rewarding moment in scenario building (in our experience) is when participants begin to recognise different scenarios as extreme versions or caricatures of their present, as if they have acquired a mysterious search-light, that can be used to illuminate different parts of an otherwise murky, entangled situation. By using appropriate scenario methods, we hope to amplify these moments of clarity that spark imagination and a pro-active engagement with the futures. We're also interested how to make the whole process more fluid, creative and mindful (of self, others and the environment). A simple description of a scenario building process can be found in How to Build Scenarios by Lawrence Wilkinson. An counter-prespective can be found in Ten Rules for Creating Awful Scenarios by Jamais Cascio, which provides a checklist of what NOT to do when creating scenarios. Using four different scenario building methods: the 2×2 matrix approach; causal layered analysis; the Manoa approach; and the scenario archetypes approach. (…) This exploratory comparison confirmed that different scenario generation methods yield not only different narratives and insights, but qualitatively different participant experiences. (…) There is little in the literature which attempts to evaluate the different types of futures insight which emerge when different scenarios methods are used, the way in which choice of method might influence the types of conversations which are enabled by different scenarios processes, or the benefits and risks in using one approach over another. (…) To some extent, any scenario method can be completed as a desk-top research exercise. But creating scenario processes that effectively create change means creating participatory processes: scenarios create new behaviour only insofar as they create new patterns of thinking across a significant population within an organisation. So how engaging is each method, and what kind of thinking, conversation, and energy does each method produce in participants? The scenario building exercise (step 1-6) in the prehearsal pocket guide is based on the 2×2 method by Peter Schwartz in The Art of the Long View. On this page Schwartz summarises the scenario building steps. Causal layered analysis is offered as a new futures research method. Its utility is not in predicting the future but in creating transformative spaces for the creation of alternative futures. Causal layered analysis consists of four levels: the litany, social causes, discourse/worldview and myth/metaphor. The challenge is to conduct research that moves up and down these layers of analysis and thus is inclusive of different ways of knowing. Our use of “alternative futures” (or “scenarios”) is usually within the context of helping an organization or community plan for and move towards its preferred future. (…) I have chosen to explain our use of alternative futures as though I were telling an interested community or organization what the components of a futures visioning process are in our understanding and experience, and how to conduct the various parts of an overall futures visioning process. 1) Continue: What are the ways in which the system in which we find ourselves could continue as it is? 2) Collapse: What are the ways in which it could fall apart? 3) Discipline: What are the ways in which it could be directed? 4) Transform: What are the ways in which it could change altogether? Phrased this way, each generic image of the future presents a challenge to test the boundaries of one’s expectations and understanding of the system. Morphological Analysis is a way to create one normative scenario, from which a number of critical uncertainties are selected and given a set of variables; by combining different variables several 'worlds' can be created, as stepping stones for a smaller set of branching scenario timelines. See also Field Anomaly Relaxation. Joseph Coates wrote “Today the question of what scenarios are is unclear except with regard to one point-they have become extremely popular. Many people see scenarios as forecasts of some future condition while others disavow that their scenarios are forecasts. Yet looking at scenarios that do not come labeled as forecasts or non-forecasts. It is difficult to tell them apart. The purpose of the scenario is at a meta level, since the scenario usually does not speak for itself in terms of its purpose.” More in Scenario Planning. Another early in depth overview of How Companies Use Scenarios was written by Mandel and Wilson. Anna Maria Orru and David Relan wrote The Scenario Symphony for the Resilients project, containing a whole range of scenario creation methods and techniques, including the dynamic panarchy and temporal model. It's interesting to compare it to the “Four Generic Futures” method above. Integral Scenario Development by C.C. Stewart is based on the holistic integral theory of Ken Wilber and integral futures of Richard Slaughter. More methods are described in the Futures Research Methodologies chapter 13 by Jerome C. Glenn and The Futures Group International. Finally, an interesting avenue to explore are remote scenario planning workshops using various online collaboration tools. Jamais Cascio describes here how he conducted a virtual scenario workshop, Noah Raford describes another experiment in online scenario planning. Below we explore different techniques/elements of scenario building based on the 2×2 uncertainty method, a method that we have used in the first months of Future Fabulators' workshops. The structure of the document is based on our questions that emerged during process-debriefs. After compiling the questions, we investigated techniques that could help us improve the process. What can we/participants prepare for a scenario workshop beforehand? What are the ideal settings (e.g. room size per person) for a scenario workshop? How to craft good questions? How to better structure/encourage designing the core question? Why does it seem more difficult to phrase questions rather than stating problems? What are different ways to map-out the past and present situation surrounding the key question? (Subject of focus): When? Who/What? + (Actors and factors relating to the subject of focus): Who? Why? What/How? Where? When to use this step? When can it be reduced/removed? When is it more important to focus on this step (observe, then interact as permaculture teaches us) than to work on possible future scenarios? In very short workshops when participants know each other well, perhaps, but it might be better to always include at least a few minutes of it, to allow participant's to see differences in perception of the same situation. What does a 'futurism without prediction' look like? When does it help to talk about things that are fixed, or constraints that exist? Force Field Analysis by Kurt Lewin, where the key question is placed in the middle, forces exerting pressure for the change on the left, and against the change on the right. What do we mean by key factors? should we make our own STEEP (or similar) cards to avoid the 'business bias'? probably, if we have the time, perhaps something related to causal layered analysis or integral scenario development focus on long term trends only + add wild cards (random images/words/tarot/playing cards…). Is there another way to look at large scale changes aside from trends (without having to do a PhD in each of the changes)? How effective are these methods and how can we usefully evaluate them? 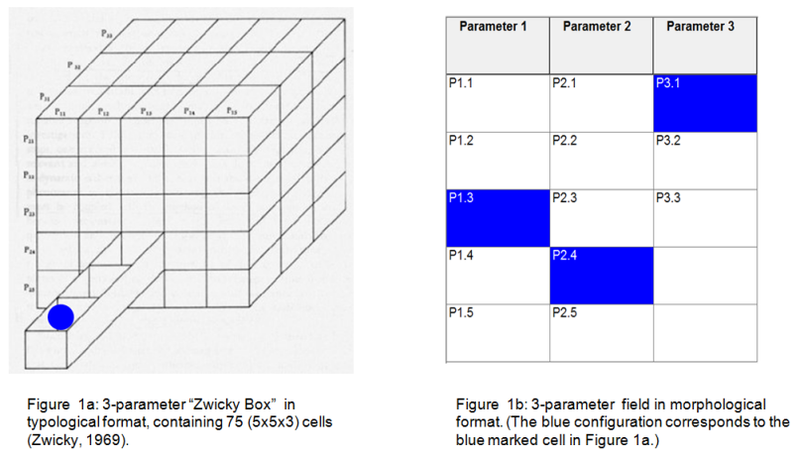 Morphological Analysis could be a great way to work with a large number of clustered drivers, that can be combined in different ways to select a smaller set of important and/or quickly create basic scenario skeletons. The foodprints ruler from FoAM Nordica works on a similar principle. Two axes method: Scenarios generated using the ‘two axes’ process are illustrative rather than predictive; they tend to be high-level (although additional layers of detail can subsequently be added). They are particularly suited to testing medium to long-term policy direction, by ensuring that it is robust in a range of environments. Scenarios developed using this method tend to look out 10-20 years. Branch analysis method: The ‘branch analysis’ method is suited to developing scenarios around specific turning-points that are known in advance (e.g. elections, a referendum or peace process). This approach works best for a shorter time horizon: generally up to five years. Cone of plausibility method: offers a more deterministic model of the way in which drivers lead to outcomes, by explicitly listing assumptions and how these might change. Of the three techniques, this approach is most suitable for shorter-term time horizons (e.g. a few months to 2-3 years), but can be used to explore longer-term time horizons. It also suits contexts with a limited number of important drivers. How to better structure building scenario skeletons with guiding questions (which questions could be generalised)? What will most people be doing in such a world? What economic problems that worry people now will be gone, or relatively minor? What environmental problems that worry people now will be gone, or relatively minor? What other problems that worry people now will be gone, or relatively minor? What new (economic, environmental, social, health, energy or other) problems will people have to worry about that are absent or unimportant now? B. How probable (likely to actually occur) is the future described in your scenario? C. How preferable is the future described in your scenario? That is, how close is it to your own preferred future? D. To the extent the future described in your scenario is judged preferable by your group, what five things need to be done now to move towards those desirable aspects of that future? E. To the extent the future described in your scenario is judged undesirable by your group, what five things need to be done now to see that those undesirable aspects not occur? Other possibilities: An option from integral scenario development by Christ C Stewart is to Apply 6 root questions (relating to factors and actors) and the AQAL framework (four quadrants by Wilber) to deepen the scenario stories. Also, the layers from Causal Layered Analysis can be used as probes in fleshing out scenarios. Finally (something we haven't explored yet): the elements of the Ethnographic Futures Framework (Bowman & Schultz, 2005) might be useful. what techniques can we use to flesh out the scenarios into interesting stories? When we practice retrocasting/retrotesting or scenario testing (as coined in the http://www.ideo.com/work/method-cards/IDEO Method Cards) we don't exclusively look at a desirable future, but at different possible futures resulting from scenario building, in an attempt to identify signals in the present that might point to the future moving in this or that direction. This is perhaps similar to the work of Dator, Schulz and others related to the “four generic futures” (see above in scenario examples), known as deductive forecasting or incasting. What tools can we use to structure scenario testing? 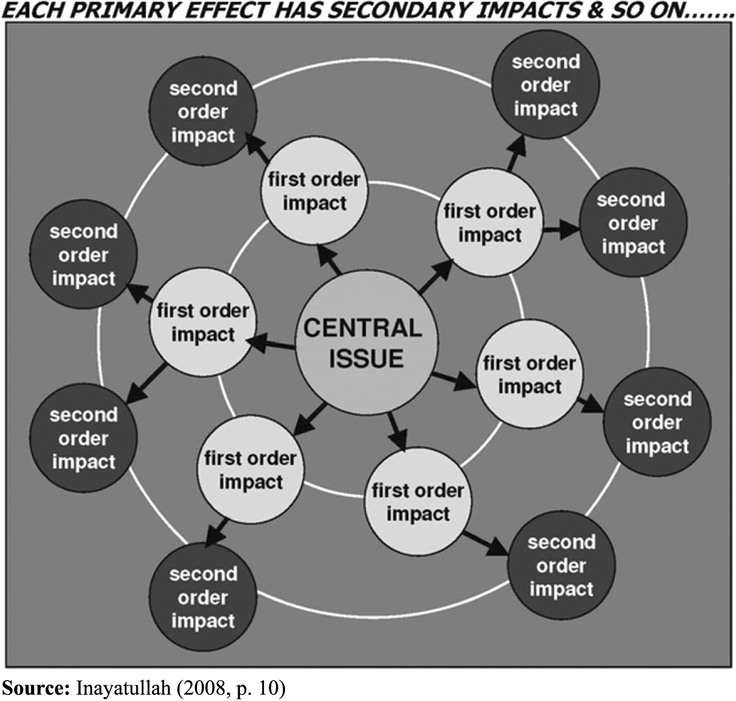 Cause & Effect Diagram: “The cause and effect diagram is used to explore all the potential or real causes (or inputs) that result in a single effect (or output). Causes are arranged according to their level of importance or detail, resulting in a depiction of relationships and hierarchy of events.” In scenario testing this could be used not as 'cause and effect', but how to get there from here (note down a topic from the scenario, then work backwards to see what would have to happen to make it happen). Another interesting possibility is to abstract principles from a scenario and retrocast from them. In this article they suggest not to use scenarios at all, but to work from agreed upon sustainability principles. what are important things to focus on? Which methods could we use to visualise scenarios? which methods could we use to prototype possible futures? How can we follow-up what happens to the groups after we finish the workshops (especially to understand what happens to commitments to actions and preferred possible futures)? How much do we need to be involved in the follow-up?